Bornemann's Afield Mobile Updates: A Taste of Seafood: The Taking of the King Crab Buck. A Taste of Seafood: The Taking of the King Crab Buck. It was my first day in the stand for November 2010. It was the 4th day of November to be exact. And, it didn’t start off the way I had envisioned. It was a rainy and cool morning as I climbed into the hemlock tree. Upon reaching the top, a feeling of nausea came over me. I was all but set to climb down and lay on the forest floor except for the fact that the slightest motion put me into a tail spin. A cold sweat was soaking me from head to toe, from inside out. Luckily, the feeling subsided within 20 minutes and I was ready for action by daybreak. Until I looked down to see my quiver of arrows lying at the base of the tree. They must have fallen during my spell. The good news was that I had one nocked and ready, but it would have to be a good one. The area had changed slightly from my last sit here. I was in a stand we call Ten Point after a hot streak of consecutive seasons of bagging 10 point bucks, including my first bow kill. One of the strongest storm systems in history was just a few days past and left many a tree lying in its path. One tree in particular looked to be just another victim. It was a 10” diameter cedar which looked to be twisted off at the base, but with optics up I could see that is was much more than that. It was a fresh rub. I couldn’t believe the size of the tree. And unless it was someone new, it could only be one deer that would have what it took to make it – King Crab. In 2009, he was well known to us, but never during daylight. 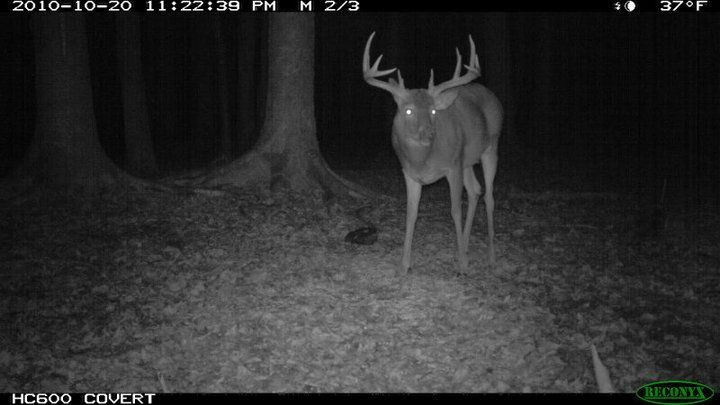 KC was frequenting the area again in recent days and in daylight no less as told by the trail cameras. On the eve of this November prime time bow hunt, upon reviewing trail cam photo highlights from the days before, King Crab was silently declared the prime target for the next few days. I was prepared for some long days in the stand knowing his recent mid-day antics could make the 12 hour sessions pay off. I could only hope he would make a daylight return. As the morning progressed, does, fawns, and yearling bucks milled about. The temperature had drifted down into the low 30’s, turning the somewhat annoying rain, into a more satisfying snow- with a persistent winds swaying our fortress in the hemlocks. Fortunately, the moisture from my predawn event had dissipated, and I was confident I would last until dusk. But, regardless of the weather, I had the protection of the Hunter Safety System 360 Extension Limb. As the movement quieted, so did the precipitation. The sun had decided to make an appearance today, as well. I turned to my brother and cameraman Brian and asked if he had a pull up rope with a hook handy. An inconspicuous retrieval of my quiver was my intent and it didn’t take too long to make the snag. I was back to 100% ready for anything. Mid-day was quiet. 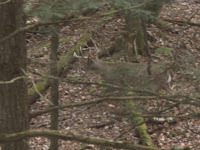 But activity picked up with a tall 2-year-old 8 pt sneaking in from behind. Unfortunately, he caught us downwind. With a single snort, he was gone. This didn’t bode well for my confidence, but history has shown us that bucks just don’t come from that direction. But, history was to be rewritten on this day. Fifteen minutes went by, and by 2:30 I was seeing my second decent buck. Strangely, I had only his body size to go from- ample shoulders and an engorged neck. 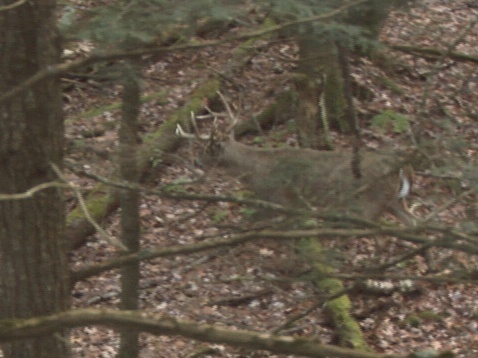 He was about 70 yards out and moving in the shadows. I can only think that he must have been carrying some dark headgear, because I could never make out the rack. As the long day approached its end, an adult doe, fawn, and yearling doe made an appearance. Upwind of us but in close range, I was content to watch them; and, frankly, intent on watching them for fear of being snorted at during primetime. With 20 minutes of light left, I heard those exhilarating words from my tailgunner, “Jeff, shooter coming in.” I thought I would have plenty of time to prepare for a shot, sliding my release out of my sleeve, easing the bow off the holder, and getting turned for the right shot. The latter the most difficult challenge with the does close. I was afraid to move too quickly. The buck was coming in the back door again. Still not moving, I figured I had a little time to get turned. But, with an excited cameraman who was making sure I heard him, I realized I didn’t. “Shooter coming. Shooter coming. Shooter coming.” I heard again. Based on this compelling declaration of my experienced treemate, there was no question an arrow would be launched, given the opportunity. That’s when primal instinct took over, not as panic to bag a trophy at sport, but as confident necessity as though my survival depended on filling my tag, now. I didn’t realize the old buck was just 5 yards, facing my tree with strands of shredded cedar hanging in his eyes - an impossible shot. King Crab making his move. With the hemlock guarding my movements, I slowly picked up my bow and faced the target. Luckily, he did what good bucks do and circled the downwind side behind the cover of tree trunks and lower hemlock branches. I focused on the crease at the stern side of his front shoulder – antlers didn’t matter – the decision was made – the sentence issued. He had three directions to head, but I was optimistic he would go for the does. He took to the left to fulfill his November purpose. I drew back just before he cleared the trees knowing he wasn’t going to be distracted from his fairer pursuit. Despite his conviction, I let out an unconvincing “erp” but he was not distracted. I peered through the site and sent the arrow on its path through the boiler room of this magnificent buck. With a mule kick, the buck was off, but the shot felt true. Frozen, I waited through that helpless eternity between impact and collapse. I watched his sprint slow to a walk, then a stagger, and finally a topple at 50 yards. King Crab was down! As we followed the dual blood trails both left and right of his path, we found the 150” 12-point lying next to a huge scrape. I placed my hands on the largest whitetail rack I have ever seen personally. The most significant feature of this old buck was the 5”+ stickered bases tangled in cedar shreds and the 19-7/8” width. This was the exclamation point of the early season - my most massive buck was a second milestone of the season shared with my junior brother. 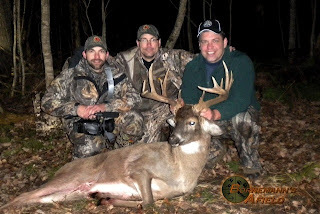 The first being my 10 year old son’s first buck just weeks prior, with my elder brother guiding and filming. My panting and shivering gradually waned as deep satisfaction and pride took its place, realizing the pinnacle of months of scouting, strategy, and preparation by the team. Once again, Mother Nature elected me to carry the team trophy that will adorn walls and websites for years to come. Jeff Bornemann and King Crab. The brother's celebrate the reward of their pursuit. As we say here at Bornemann’s Afield, "The Pursuit is the Reward". But, today a big ‘ol buck would do just fine. Up-to-the-minute texts and mobile uploads from the field. Texts. Pics. Video. All from 'afield'. Receive a daily summary of posts via email.